April 1, 2017: First ride of the season in good ol’ Minnesota. It was in the 60’s and beautiful. Met up with a great bunch of people, and we rode and rode. Couldn’t be more grateful. Being back on the bike after 5 months off, reminded me of a few important things, which I’m pleased to share with you. Group Riding: Everyone has their own riding style. Stay true to yours in a group. Figure out where you are comfortable. Go at your own pace. If you feel most comfortable in the back, stay there. Gravel: Our good friend gravel is out early in the season, more than ever. Keep your eyes open and go slow. No need to rush it there. Gravel, actually, is not our friend. 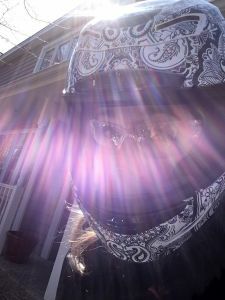 Confidence: I’m a newer rider, and the minute I feel confident about my riding skills, is the minute I venture into riding territory I have no business being in i.e. speed and curves. For me, I need to be a new rider every day. That’s me, and I’m sticking with that approach the rest of the season. New. Every day. Helmets: I love my helmets, and I’ve started to buy them like I do cowboy boots and leather jackets. It’s becoming a sickness, but anything that keeps this amazing and gorgeous brain of mine safe so I can think, write, run my business, take care of my kids, and move around in this amazing world — I’m protecting. To your beautiful wild, always. * Stacy rides a 2106 Heritage Softail Classic, and is the founder and lead writer at Two Wheels to Wild, a motorcycle and lifestyle blog. She owns a Minneapolis-based public relations firm and is a writer for the City of Sturgis and Sturgis® Motorcycle Rally™.